Derek Andersen is the founder of Startup Grind, a 50+ cities community designed to educate, inspire, and connect entrepreneurs. In 2013 Startup Grind will host 20,000 entrepreneurs at 300 events in 20 countries. 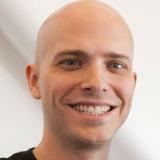 He is also Ex-Electronic Arts where he worked on games like Burnout, Mirror’s Edge, The Sims, and Need For Speed. Having spent 8-years living outside the United States, he currently lives in Palo Alto California with his wife and two children. Should You Trust Your Gut? The Answer Is Yes.